Longtime developer Harry Rinker—who at age 93 still conducts daily business at his office in Newport Beach, Calif.—said that of all his contributions to the Wood River Valley, he is most proud of the ongoing Rock Creek Ranch project. “We could have sold the water rights for a lot of money, but we chose not to so we could give it to the Wood River Land Trust,” Rinker said last week. Though Rinker’s many developments in the valley have no doubt been lucrative, he has a long history of taking environmental values into consideration. 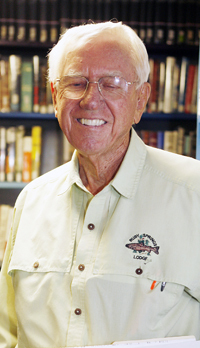 Rinker began his career by building tract homes in Garden Grove, Calif., in 1953, and first came to Sun Valley in 1961. He said in a recent interview that it was immediately clear to him that the area had development potential. Rinker estimated that since that time, he’s developed between 600 and 700 acres in the Wood River Valley. His first local development was Gimlet, south of Ketchum, in the mid to late 1960s. In the 1990s came Golden Eagle I and II, which he points to with particular pride. More recent projects have not been as successful. In 2005, Rinker and John Sherer asked to have their 550-acre combined properties just south of Bellevue annexed into the city. The additions would have nearly doubled the size of Bellevue. The proposed development linked to the annexation, called Woodbridge Village, would have included almost 600 homes as well as a central park with soccer and baseball fields and a neighborhood shopping area. For two years, council members debated the costs and benefits of such a large addition to the city. In 2007, however, Rinker announced that he couldn’t make the project work financially and withdrew the application. In 2006, Rinker met with the Blaine County commissioners to introduce plans for a 69-lot planned-unit development and nine-hole golf course on Peregrine Ranch north of Hailey. The project was proposed in partnership with The Valley Club to create the first 36-hole golf course in Idaho. But in 2009, Rinker informed the county that he was withdrawing his PUD application for the development. He said in an interview at the time that he was doing so because of the Valley Club’s inability to build the golf course addition. Rinker said last week that he plans to hold on to the property until it’s eventually developed. “That’s the only large piece of property left between Hailey and Ketchum,” he said. Asked what’s changed since he began developing property in the valley 50 years ago, Rinker simply pointed to the difference in time that it took to get through the planning and zoning process then compared to what it takes now—120 days for the Gimlet development and two years for each of the Golden Eagle projects. But he decided to leave a different sort of legacy at Rock Creek Ranch, east of Bellevue.